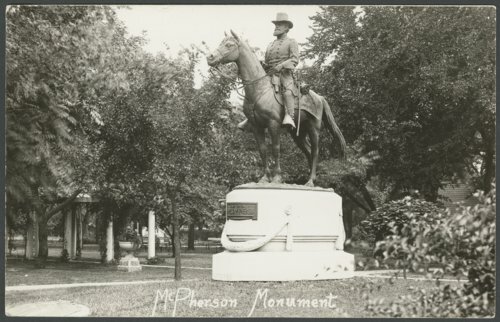 This postcard shows the statue of Major James Birdseye McPherson in McPherson, Kansas. This bronze monument honors the career of a Union General and the namesake of McPherson, Kansas. Located in the city park and across from the county courthouse, it was unveiled in July of 1917 and is considered the first life-sized equestrian statue erected in the state. The inscription on the base reads "James B McPherson Post No 187 G.A.R. ".